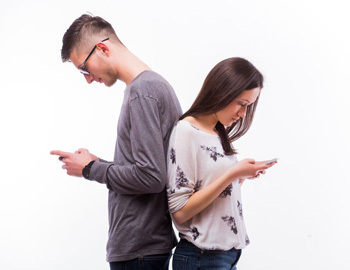 Any of these means of electronic communication can, and frequently are, used as evidence in court during a dissolution of marriage or modification proceeding. When going through a divorce or modification action, expect that your electronic communication and social media will be scrutinized. Always assume your communication will eventually be seen by the Court. Only include information that is necessary and be sure your language and tone are such that you would not be concerned if it were seen by a judge. Be calm and collected before sending any communication. Never send a text message, email, Facebook message or post in a moment of anger. Your hostility will be evident and once it’s out there, it can’t be taken back. Rough drafts can be useful. Start with a draft of what you would like to communicate to your spouse or ex-spouse. Before you send it, review it closely to be sure it relates only to necessary communication, conveys your message in a concise and straightforward manner, your demeanor is appropriate, and your message cannot be misinterpreted. In addition, remember that your electronic communications and social media activity can be used in a variety of ways. It can be used as evidence of your state of mind, to undermine your credibility, to demonstrate your character or habits, or to show where you were at a particular date and time – amongst many other uses. Remember, once you hit post or send, there is no going back – your message is permanently backed up and accessible to the opposition.